Oriented towards maintaining its ability to develop and provide innovative services and products to its clients, NEWSPHONE constantly invests in its infrastructure which – in combination with its highly specialized staff – constitutes yet another advantage in its dynamically ascending course. The headquarters of NEWSPHONE are situated in a modern building, in Kallithea, whose total area exceeds 4,000 square meters. 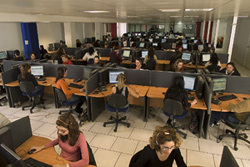 The said facilities are also home to CALL CENTER HELLAS and NOETRON, and constitute the administrative and operational nucleus that provides planning and implementation of the Group’s strategic decisions. With regard to the technical and telecommunication infrastructure, NEWSPHONE has a wide spectrum of tried and tested state-of-the-art technological “tools” which are constantly updated and extended, in order to meet its clients’ needs flexibly and efficiently.